From my earliest memories until I left town for the Air Force, Bridgewater Congregational Church was always an integral part of my life. 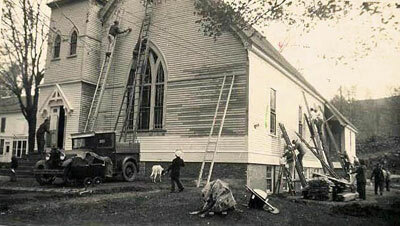 There is a photo of the church being painted around 1946 and the little guy dressed in a sailor suit is me! Now in church sometimes if I close my eyes, my mind wanders back to that little church in Bridgewater. I can see Bessie Woods, Uncle Stim and Horace up there in the choir singing their hearts out. “My God I thank thee who has made the earth so bright!” I think it is on page 11 in the hymnal. Ben Needham ringing the bell every Sunday, Betty Ann playing the organ and Myrtle Adams before her. There’s Burnside Holt, sitting in the back pew and Harold Perkins of course. I think of the pastors like Mr. Wells, Mr. Kraut, and Mrs. Cronk who all served so well over the years. And there were fun times there also, church suppers and the annual fireman’s feast down in the church hall. I remember coming out one night absolutely stuffed and Pete Taylor remarked in his dry wit, “Well I guess I’ll go home and have some crackers and milk!” I still crack up every time I think of that! What characters we had around town. When my Mom and Dad died I came to realize even more what a special place Bridgewater was. It was hard to distinguish between family and community. The outpouring of love and concern enveloped us. Of course my Mom was “Grandma” or “Aunt Ruth” to at least two generations of “Bridgewater Kids”. And Dad was the savior to everyone in town with a broken down car or piece of farm machinery. He worked his magic with the welder down in our garage and usually never took pay for it. Earle and Ruth honored us from the respect shown from the townspeople of Bridgewater for their lives.